It was a dream from a long time to travel in 1st class in Indian Railway. The last time I traveled in 1st class was early 1985 when we went to Puri ( a must stop for Bengali ). So when the dates for summer vacation became clear started booking for train tickets. It was month of December when we booked ticked for April. Wanted to book 2nd AC ticket but to my surprise it was already sold out so opted for AC 1st Class. The price of AC 1st class is almost like air-fare on a positive side you get a personal cabin/coupe and great food and service but it still takes looong time to travel between Bangalore and Calcutta. It takes 2.5 hours in flight and 28 hours in the fastest train which is called as Duronto (quick). We wished to get a coupe for ourselves as when you book a AC 1st Class ticket you don’t get a seat number like other class just till 4 hours of train departure that is when Railway prepares the boarding chart. Doing few search on internet one gentleman suggested the best way to get a coupe to yourselves is go to the boarding railway station and get a special ticket for your pet for a minimal price. Now that way Railway will not mix you with others and on the day of journey you can always say you left behind your pet with a friend. The day of journey started with two unpleasant news. The first one maid called up to inform that she is not coming. Oh! that was hard, Pamela had to clean the house, utensils to her best as she was leaving for almost 4 weeks. And the second was rash on Aarush back. Hmm not a great start as we were not sure what the hell is this. The pre-booked taxi came well before hand and to our surprise we reached Yashwantpur in jiffy. We had to wait for an hour before boarding the train which was unpleasant with heat but a good warm-up session for the hottest summer ahead as we leave Bangalore. The train started on time and we were greeted with red roses and wet tissue from the greeting staff. Soon they gave water bottles and told us they will be serving soup soon and checked if we need anything before that. The food was great and it was served with proper cutlery and there was foldable tables. They even came back to check if we need any extra item while having lunch. We had Indian Lunch and continental dinner and in between he had snacks, tea-coffee and soups. The journey was really relaxing the way I wanted till we reached Cuttack (Orissa) next day, where our train and other trains including Rajdhani were stuck for 2 hours as there was protest from local people demanding one over-bridge. This two hours delay just killed all the fun, as soon passenger started to agitate and there was a big drama when people were complaining we in 1st AC still enjoying AC while they are not J. But the reality was we did not but as AC-1st class are cabins and have less people it was getting hot slowly. But again that reminded us of Calcutta which is synonymous with agitation all the time. Over the years people of Bengal have really do not know how to take ownership and lead to solve problem of their own they are always blaming someone. Any way after all that we started for Calcutta and soon it was lunch time. Well we reached a rain soaked Calcutta post dark, it was relief from heat but took a long time to reach our pre-booked hotel at central Calcutta. A journey we will cherish long time as not sure next when I am going to have the luxury of time. Chennai DRHM ( Dream Runners Half Marathon) was on 1st Sunday of July i.e. 7th July 2013. It was the first run out of Bangalore for me. 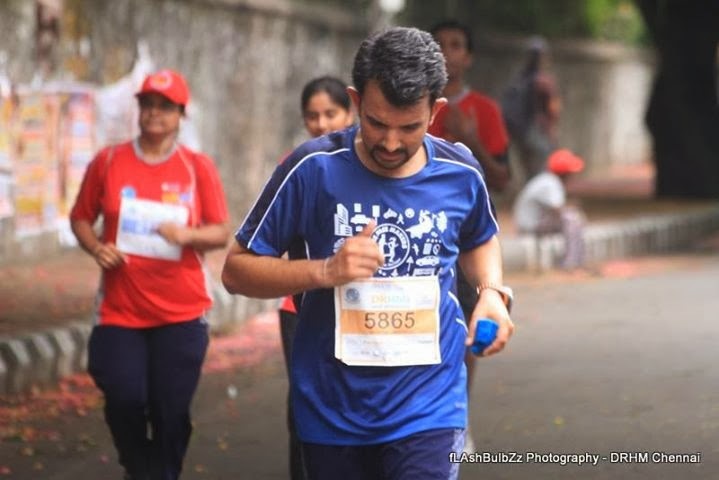 Last time I registered for Mumbai Standard Chartered was in 2008 and was gifted with Aarush just few days before the race :D Well Aarush is the reason why I can not run on weekdays morning but he is the catalyst who introduced me to The Pacemakers running group of Bangalore. It was a great escape for me from Bangalore and daily routine. a big thanks to Pamela for supporting me on this. Knew it was not going to be my best run given the fact I was not practicing at all. The last time ran was beginning of June after that it was all about running around household and office work. Working late and on weekends and busy with Aarush's school and what not. In fact I was so messed up posted The Pacemakers Facebook page that “I am not going” but thanks to Pamela after an hour posted “I will” be going. Thanks to fellow runners a cab was booked and woke up Saturday Morning at 4:30 and meet them at the gate at 5. 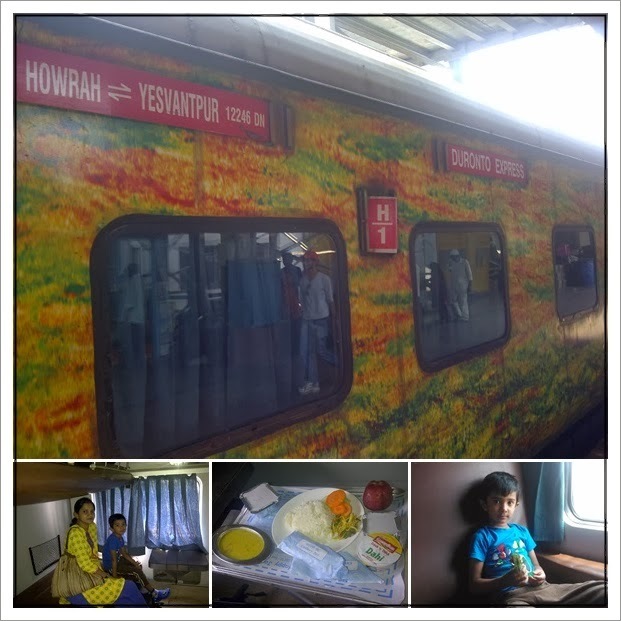 We were at Containment Station by 5:40 where already few fellow runners were waiting, at 6:10 boarded the Shatabdi. The train journey was fun brought back the memory of college days where traveled in a large group for the last time. It was fun to be noisy and so many small group chit chat ... it was real entertaining. As soon reached Chennai the humid heat welcomed us and oh! that smell of Chennai Central. Thanks to our Tamil friends we moved to the electrical (local) train platform and took a local train towards hotel, the last part from station to hotel was long walk . We crossed many ministerial bungalows as walked from Station to our hotel Raj Palace. Reaching hotel there was enough opinions for lunch venue/cuisine between 30+ hungry stomachs personally stayed back had the same in the hotel and had a long nap till dark. It was ladies Final at Wimbledon and soon our room was packed with 20+ people as it is more fun to watch in group. Everyone thought it would be a big fight between German and French. But Bartoli finished the tournament quickly in a straight set with ace. Well she did not beat any big names in this tournament but she beat those who did ... a dream came true. Dinner was like lunch again many opinion and this time personally went out to explore little beyond hotel to ‘Saravana Bhavan’ the place was packed as usual and had Paneer Dosa a foolish choice before a long run tried to mitigate with Dahi Vada (yogurt to neutralize the richness of Cottage Cheese and oil) . The bus ride back to hotel was long we had we had a walk mile personally liked it after a big meal. Woke up at 3:30 had a quick shower and realized it is going to be a tough one as was not feeling good in stomach. We were supposed to be out of hotel by 4 but there was big time drama by the arranged cab drivers, was part of the last drop. The sky was dark with cloud and it rained a lot in the night but still the weather felt hot and very very humid bay around 75~85% precipitation. Tried to follow Coach’s warm-up session but the school ground was full of sand and dropped out from the running one. The race started at 5 and started my stop watch for the first time running with a watch and that too a GPS enabled, started with few pacemakers for the first few kilometers and then started running of my own pace which felt very good about. And every Kilometers Garmin showed my speed and all was looking very nice. Soon say the lead runner coming back and it was none other than our Nanjundappa. The second runner was at least a KM behind him. Soon saw many of the Pacemakers taking the turn. But my run took a downhill as I struggled from 13KM onwards. I felt there are too much water in my bladder and I am tired from the humid condition. So I walked run and continued till the end and many people crossed me in that process. The 2 KM I tried again to push myself but by that time I was out. As soon as I finished the race said bye to pacemakers group and walked back to hotel. Well it was a long walk but did not want to haggle with Autos. The race was very organized with lots of police and volunteers and roads are so good that it does not seem like India. The coarse was also perfect as we ran along Bay of Bengal and the famous Marina Bay only humidity was a concern but there is no way we can avoid that in this time of the year. The sun was completely out as sky was covered with dark cloud I think it can not be better than this in July in Chennai. Installed all these three on pamela.santm.com and blog.santm.com which are running on wordpress 3.6 trunk. moved the dns details to cloudflare. While Pamela's hobby site did very well Google page test result our blog result was not great. Looks like the culprit is inbuilt gallery of wordpress which is re-sizing images and seving them on fly causing high server time. the command that helped me a lot is "mogrify -strip *.jpg" which is part of imagemagick tool kit and removes exif data from images.